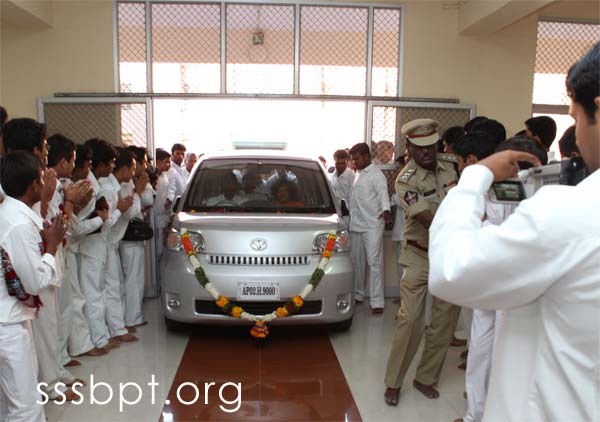 Sri Sathya Sai Baba visits the Sri Sathya Sai University, Prasanthi Nilayam and Sri Sathya Sai Senior Hostel for Boys. Sathya Sai Baba Info, Books, Sai centres, mantras, Miracles, Bhajans, Letters from Sai Baba, Sai Meditation, Sai Baba Prophesies....Click here. 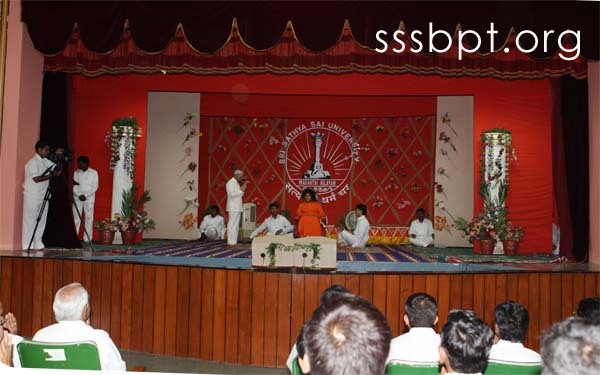 Bhagawan visits the Sri Sathya Sai University, Prasanthi Nilayam and Sri Sathya Sai Senior Hostel for Boys. Everything Bhagawan does is a treat to watch if one has the eyes to observe and the heart to follow; and once you are tuned there comes lessons galore to imbibe and practise. Perfect master that He is, He never leaves any stone unturned to mould the students into future citizens of a promising era. The Young Sathya, in His teens while declaring His divinity, had advised those who flocked around Him to worship Him on Thursdays. Ever since, Thursday has been ‘the holy day’ in Prasanthi Nilayam, though the theory ‘everyday is auspicious’ was very well accepted by Sai Fraternity. 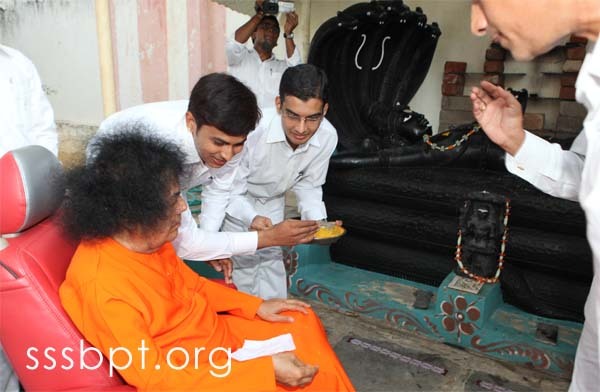 The ‘holy’ Thursday’s imprint was quite apparent when, for the past many a year, on the first Thursday after the commencement of the academic year, Bhagawan has been regularly making customary visits to the Institute in Prasanthi Nilayam. In the years when He stayed away from Prasanthi during the summer months, this routine would invariably happen on the first Thursday after His return to Parthi. This year, 4th June 2009, being the first Thursday, was the day when students, staff and the entire University eagerly anticipated with greater hopes and prayers for yet another Divine visit. 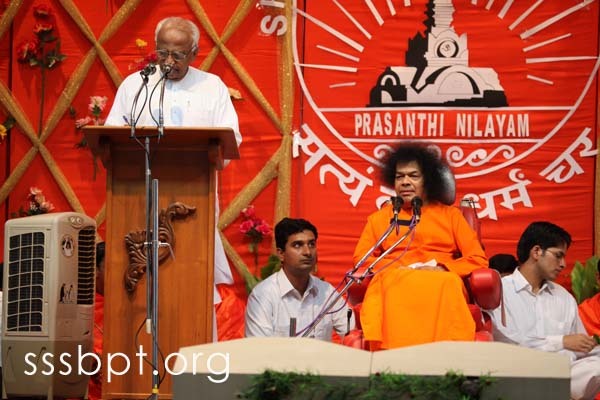 Acceding to their prayers Bhagawan drove down to the Institute Auditorium in the evening at 4:15, to pep up the spirits of thousands of aspiring young minds and hearts. Earlier, during the day Bhagawan came out in the morning at 11:30, driving down to the Institute to oversee the preparations, especially the decoration part. Here is the perfect master who never leaves any stone unturned when it comes to setting an ideal. He set the standard, He peps their spirits up, He works through them, and finally He goes Himself to partake, in the pretext of enjoying, giving those ‘little hearts’ the unusual feeling of fulfillment. Read on for a report from Sri Shashank Shah, Research Scholar, Sri Sathya Sai University, on the blessed evening’s happenings at the hallowed portals of the Sri Sathya Sai Institute. 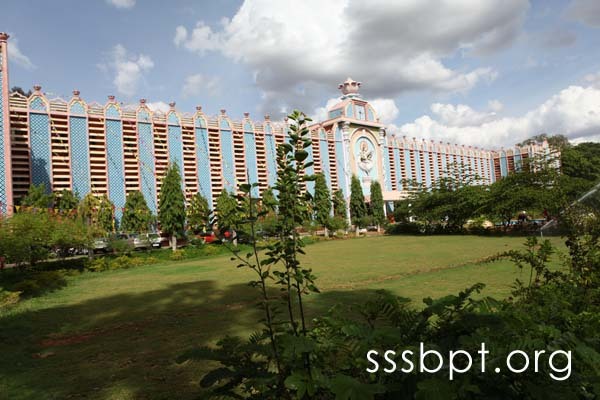 The Sri Sathya Sai University (SSSU) has a unique privilege of having the Chancellor of the Universe as its own Chancellor. And when the Jagadguru Himself takes the role of a teacher, there are no words to describe the good fortune of the students. Today was one such day, which would be etched in the memory of all the faculty members and students of the Sri Sathya Sai University. Bhagawan had graciously consented yesterday to come to the college auditorium and bless the students with His Darshan, Sparshan and Sambhashan. Bhagawan arrived at the auditorium at about 4.15 pm with the welcome and reverberating tunes of the Panchavadyam played by the students of the University. He was greeted at the entrance by the Hon’ble Vice Chancellor of the University, Prof. Vishwanath Pandit, the Principal of the Prashanti Nilayam Campus, Prof. U.S. Rao and also by the newly appointed Registrar, Dr. Naren Ramji and the Controller of Examinations, Sri G.S. Srirangarajan. He was led into the hall by a group of Vedam students chanting Vedas with full gusto. While Bhagawan was seated centre stage, Bhajans were going on with full gusto. The first part of the programme was the release of two books at the Divine hands. Both these books were a part of the Educare and Management Series of books of the School of Business Management, SSSU. The first book entitled ‘Soulful Corporations – Ushering in a Better World’ was presented to Bhagawan by the authors – Prof. V.E. Ramamoorthy and Shashank Shah (Doctoral Research Scholar). Bhagawan very graciously pulled the strings of the ribbon covering the book and very lovingly went through its contents making minor observations on a few occasions. He looked pleased with the work and blessed Prof. Ramamoorthy with a sweet smile and a pat on his back. The second book entitled ‘Corporate Stakeholders Management-Why, What & How – A Dharmic Approach’ was offered to Swami by the authors Shashank Shah and Prof. Sudhir Bhaskar. Swami very graciously glanced through the pages of the book and blessed both the authors lovingly. Thereafter, the VC, Prof. Pandit delivered the welcome address. He highlighted the achievements of the University and the extraordinary results of the students in the recently concluded exams. He also highlighted the recent developments in the University and the new strides made by it in various fields. He concluded with his observation on the important role of the University in the Avataric mission and the important role the alumni should and are playing in the world outside. He sought Swami’s blessings to be befitting instruments in the Divine mission. 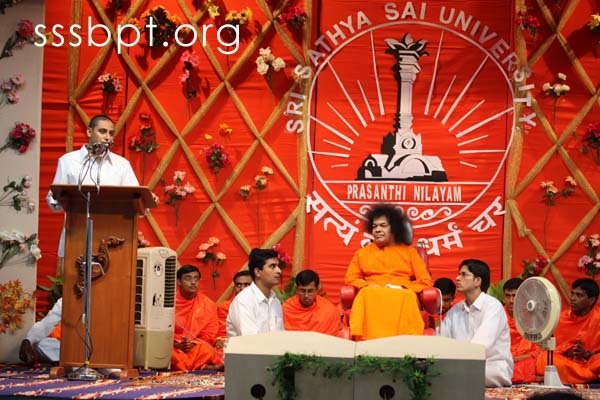 Aman Jhaveri, the student speaker, a second year MBA student of the SSSU, spoke on Swami’s message on ‘Love for God, Fear of sin and Morality in Society.’ He shared examples from his own life as to how he has benefitted from this teaching of Swami. Bhagawan in His exhilarating Divine Discourse, highlighted the importance of Daiva Preeti, Paapa Bheeti and Sangha Neeti in today’s world. He highlighted the need for the youth of today to abide by the customs and traditions of the rich Indian culture. He also stressed on the need for the youth to respect, love and serve their parents till their very last breath. The students owe a lot of debt of gratitude to their parents for whatever they are in their life and they should express the same to them in form of loving service. An educated citizen should be an embodiment of humility; earning prestigious degrees serves no purpose if they were not put to good use by living an ideal life; education should not be focused on earning a living but should be for a more purposeful life, exhorted Bhagawan. He also stressed on the fact that the very same Universal Atma existed in one and all; but for the physical differences that existed between mankind, the essential unity is the Atmic Unity. Divinity is pure and unsullied and is beyond the name and form. Man has ascribed various names and forms to Divinity for his own convenience. Through regular contemplation on the highest principle, man should transcend the form and become one with the formless. Bhagawan also quoted examples from the great epic Ramayana to further illustrate some of these profound principles. He concluded the discourse with the Bhajan – Hari Bhajan Bina Sukha Shanti Nahi. Thereafter, quite abruptly Bhagawan left the auditorium and to everyone’s surprise proceeded towards the senior students’ hostel. All the students rushed from the auditorium towards the Hostel to be a part of this rare blessing. It’s true; God’s delays are not His denials. After a long gap of nearly three years, Bhagavan visited the hostel. He entered the dining hall of the Hostel in the car and then proceeded to the newly constructed meditation room and inaugurated it by cutting the ribbon, sprinkling Akshatas and lighting the lamp. Through his gaze He charged the idol of Hanuman, the great devotee of Lord Rama which was placed in the center of the Altar and was in the meditation posture. He then went around the room and the adjoining rooms and expressed His satisfaction at the construction and decoration of the premises. He then visited the Vaikuntha Narayana Vanam where the idol of Lord Ranganatha with His consorts has been installed for nearly two decades. These idols were sent by Swami nearly twenty years ago and have since then been a prized possession of the Hostel. Swami had also sent in October 2007, special marble idols of Lord Rama, Lakshmana, Mother Sita and Hanuman especially for the senior students’ hostel and which now adore the central position in the Hostel altar. After showering His loving blessings on all around and spending precious 20 minutes in the hostel premises, Bhagawan returned to the Mandir. Indeed a most memorable day for the students of the SSSU with dual blessings received both in the hostel and college, marking an auspicious beginning to the new academic year. A day that would be cherished by all those who witnessed and participated.